Switching more and more advertising to more and more channels is no longer a solution to fight for attention. Classic online advertising is at a critical juncture because many customers are already blind to banner ads or user ad blockers. The trend is towards relevant, personalised, and contextual content. In addition, customers often don’t directly search for specific products, but in the first step for inspiration and ideas, as well as for advice and tips. Good content grabs a customer’s attention before they even decide to make a purchase. The first step is, therefore, to provide customers with added value and then discreetly draw attention to a product. Content commerce can be the solution to stand out from the rest. In our new white paper, we show how brands, retailers, and manufacturers achieve this through four key factors: solid brand loyalty, increased brand confidence, an improved Google ranking, and increased conversion. Blogs and online publications are now one of the »classic« places to implement content commerce. Whether visual or audible, classic or visionary – individual worlds of experience that appeal to all the senses offer creative ways to provide users with tips, tricks, and inspiration about their own products. The best of content commerce is user-generated – Contents that is created by customers themselves. After all, who’s a more credible advertiser than an actual customer? In the era of social media and increasing mobile media consumption, videos are the key to customers’ attention. Video content can help companies inspire customers, show them how to integrate products into their everyday lives or explain products that need explanation. 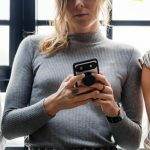 In the course of content commerce, another trend is gaining in importance: Artificial Intelligence (AI): It’s able to analyse content and evaluate which content is the most successful. Based on these ratings, the most successful content and related content will be positioned more prominently in the future. The combination of content and AI is also promising for personalisation. Based on information about past purchases, interests, age, and gender, content can be individually suited to each visitor. Amazon, Apple, and Google are currently embarking on a race to integrate their voice-based assistants into every conceivable smart device. According to a study by Adobe Digital Insights, sales of digital assistants increased by more than 104 per cent in the last quarter of 2017. Content commerce will also benefit more and more from digital assistants. In addition to the distribution of content via text, images, and videos, content can also be distributed by voice. This creates completely new ways of communicating with customers. Despite personalised and inspiring content, there is a crucial hurdle that still keeps many customers from shopping online: They’re not able to try, touch, or even smell products before they buy them. For this reason, new features and content formats are constantly being developed and should make it easier for customers to make their purchasing decisions. Numbers don’t lie. In our current white paper, we present current studies and forecasts for content commerce on both the customer and the business side. The integration of content and commerce isn’t just a content challenge. Concrete technical feasibility should be questioned early on. In addition to high-quality, inspiring product sections, a flexible and high-performance digital system landscape is needed to profitably implement content commerce. Which should be the leading system? Is the data synchronised meaningfully? Where should the content be played? 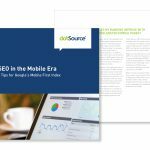 However, system landscape and technology are not the only challenges a business needs to master in designing a successful content commerce strategy. The merging of content and shopping experience also requires completely new processes within the company, new employee responsibilities, and cross-departmental collaboration. 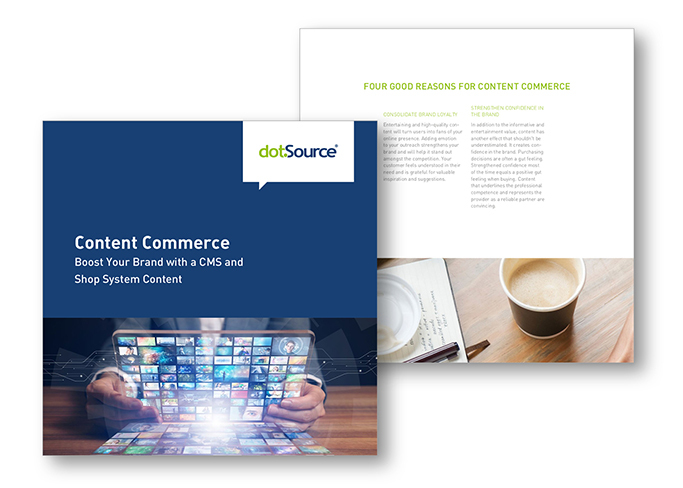 Our new white paper »Content-Commerce. 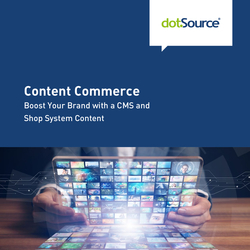 Strengthen Your Brand With a Valuable CMS and Shop System Content.« uses best practices to demonstrate the external and internal challenges facing brands, retailers, and manufacturers in designing and implementing a successful content commerce strategy. With this latest guide, we’ll show you how to merge valuable content with a seamless shopping experience. You can download the white paper here for free.